Festival season is looming around the corner, and today we get another big-ticket event to add to our itineraries. 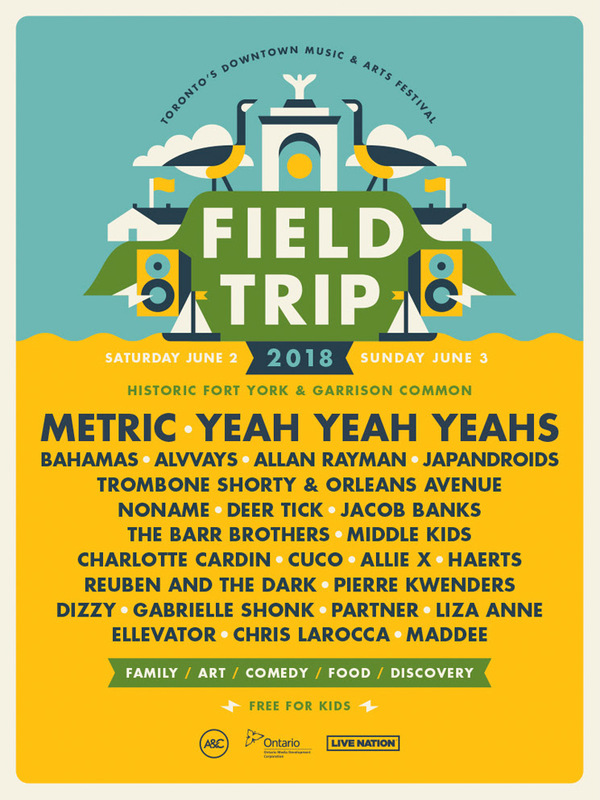 Field Trip is set to return to Toronto's Fort York & Garrison Common on June 2 and 3, and the full lineup is finally here. This year's lineup includes performances from Metric, Yeah Yeah Yeahs, Bahamas, Alvvays, Allan Rayman, Japandroids, Trombone Shorty & Orleans Avenue, Noname, Deer Tick, Jacob Banks and the Barr Brothers. The fest is rounded out with performances from Middle Kids, Charlotte Cardin, Cuco, Allie X, Haerts, Reuben and the Dark, Pierre Kwenders, Dizzy, Gabrielle Shonk, Partner, Liza Anne, Ellevator, Chris Larocca and Maddee. Tickets for Field Trip will go on sale on Friday (March 9) at the fest's official website. Learn about the festival's history with Exclaim! 's festival profile.